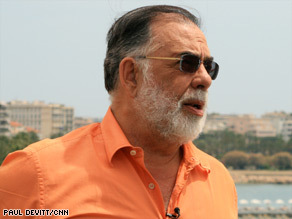 CANNES, France (CNN) -- When it comes to telling a story, few know how to do it better than Francis Ford Coppola. Director Francis Ford Coppola traveled to Cannes to unveil his new film "Tetro." The director of films such as "The Godfather" trilogy, "Apocalypse Now" and "Tucker" is at the stage in his career where he can work on any project he chooses. His latest is "Tetro," his first original screenplay since 1974's "The Conversation." In the movie -- shot in black and white with splashes of color -- the five-time Academy Award winner has fictionalized memories and experiences from his own life to tell the tale of the relationship between Tetro, played by Vincent Gallo, and his younger brother Bennie, played by 18-year-old newcomer Alden Ehrenreich. Coppola traveled to the 62nd Cannes Film Festival to unveil "Tetro" at Cannes' Directors Fortnight. He spoke to CNN about his new movie, the tradition of stomping grapes and why he probably won't be caught out on the links too often. CNN: Tell me about Cannes, your experience here. Francis Ford Coppola: I've been here maybe five times. Especially in the early days of Cannes, it's always exciting. You see people walking on the streets, we have nice weather, and there's all the boats and excitement of the movies coming. Keep up with all the glamour of Cannes each day on CNN and each night with A.J. Hammer and Brooke Anderson on HLN's "Showbiz Tonight." CNN: Let's talk about "Tetro." Coppola: I was about, I don't know, 17, 18, but I found a half a page that began the first scene. There wasn't a lot there, but there was definitely a mood. I came across this page, and I wonder what it would have been like had I really looked at it. When I put it away, I thought about it, and I found myself continuing that half a page and the second page and the third page. Of course, originally it was a story about a sailor who comes back to find his brother in Detroit, and I changed it, because he's not really a sailor. I'm not going to spoil what he really is, but he's in a white uniform, and he goes into Buenos Aires looking for his brother, and at that point I wrote it just like a year and a half ago. CNN: The use of black-and-white and the splashes of color, what was the purpose of that? Coppola: Well, black-and-white is a great photographic tradition in movies. Most of the great films made were made in black-and-white, and if you took a list of the greatest movies ever made, probably eight of them would be in black-and-white. It's a very different photographic discipline, just a very beautiful one and right for my story. I thought, why should we not have black-and-white anymore just because some television executives don't pay as much for the black-and-white form, which is ludicrous? CNN: How much of your family is really portrayed in this film? Coppola: The truth is, nothing in the film really happened, but it's all true. I mean, my own father was quite a wonderful man, and my brother's great, and you know I always idolized him and looked up to him, which is probably what the story is about. But none of the real particulars of the story are real. It's all fictional, but the feeling behind it is very personal. I was probably writing to understand myself and how I felt about all those things. CNN: What about your winemaking business? Some people can say you have accomplished everything, five Academy Awards, you can just hang up your hat, retire and be done. Why make "Tetro"? Coppola: I never got the chance to be the writer/filmmaker that I wanted to be. That's what I started out with in earlier films and "The Conversation," which was a movie that I wrote. I wrote another story after that and that. I am at a position ... [of] being successful, and that's an area I would like to develop myself, as a writer/director of films. CNN: Your family, I read that you have a special tradition of grape stomping. Do you still do that? Coppola: Well, that's sort of a tradition. We have the harvest party. We always put out a barrel of grapes, and people can jump in it, and then we drink the wine from the year before. Coppola: To read a great book, to see a great movie inspires me. Any work of art that's done beautifully is an inspiration. CNN: What aren't you good at? CNN: Really? When you are here, is it all work for you or do you get to kick back with your family? Coppola: We have some fun dinners, but we're not here for a long time, two to three days. You have to make yourself available to whoever and whatever can help the movie. And hopefully people will go see the film or at least the Web site. The purpose nowadays because of so many wonderful things for people to do, and things for people to see -- not just movies, but sports and music are competing -- and you have to have people come and see your film. CNN's Lisa Respers France contributed to this story.